Mallett began his rugby career with a call up to the Western Province Currie Cup team whilst a student at Cape Town University in the late 1970s. Mallett moved to Oxford University in 1979 and won blues in rugby and cricket, once dispatching the great Ian Botham for three sixes in an over during a friendly against Somerset, before returning to play for Western Province. Between 1982 and 1985 Mallett was part of the side that won four consecutive Currie Cups, and he was rewarded with two Springbok caps in 1984 against the touring South American Jaguars. Mallett's coaching career began with St Claude in France, a small side in the Jura Mountains whom Mallett played for and coached for five seasons before moving to Boulogne-Billancourt in Paris. In 1994 Mallett returned to South Africa and took up a post with False Bay Rugby Club, before moving on to coach the unfashionable Boland Cavaliers to a narrow defeat in the Currie Cup quarter-finals. Following two seasons with Boland, Mallett secured an assistant coach position with the South African national side in 1996, before taking control the following season. His return to rugby was again in France, with Stade Francais. The club was rich in cash and facilities but light on silverware upon his arrival, and he subsequently won consecutive Top 14 titles in 2003 and 2004. Mallett again returned to Western Province in 2004, this time as director of rugby. Having been linked with an England role in 2006, Mallett returned to the international rugby as the new coach of Italy ahead of the 2008 Six Nations. Italy were only able to register a single win and the following year Italy finished bottom again, after a disappointing campaign with Mallett's selection of flanker Mauro Bergamasco at scrum-half against England leading to much criticism of the coach. However, there were clear signs that under Mallett's control Italy were making up ground on the international stage. And during the 2011 campaign, despite a thumping away to England, Italy continued to make progress, coming close to upsetting Ireland and Wales at home before clinching a historic 22-21 at home against France. Despite that historic result, the Italian Rugby Federation (FIR) decided it was time for a change of personnel and lined up Perpignan coach Jacques Brunel to take over the side which he did following the 2011 Rugby World Cup where Italy failed to progress past the Pool stages. 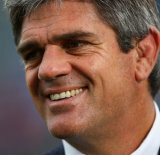 Mallett reportedly turned down the chance to take charge of French side Toulon following the World Cup and was subsequently linked with the England coaching job. However he missed out on the England head coach role as the Rugby Football Union favoured Stuart Lancaster.